─ Thank you for taking the time out of your busy schedule for this interview. ─ To begin, when did you become interested in becoming an animator? It was during my 3rd year of high school. I remember I barely made my decision in time. Oekaki boards and paintchats were popular back then, so I’d often hang out in those on days when I didn’t have after-school activities. You’d find professional illustrators and people working in anime here and there, and as I started talking with them, I found myself wanting to join their ranks. First, I ruled out becoming a mangaka because I couldn’t write stories, and also becoming an illustrator because I didn’t want to do the coloring. It was a sad process of elimination (laughs bitterly). At the time, someone who was already in the industry recommended FLCL and Digimon Adventure: Our War Game!, which were really great. And so it became clear what I wanted to do. ─ Did you already have some favorite animation works before that, as a kid? I kept up with the shows that aired during dinner time, like Dragon Ball and Sailor Moon. Also, my family would often rent Disney movies so I watched those. Pinocchio, Dumbo, Aladdin, and so on. Pretty much all mainstream stuff. I remember Osamu-san reached out to me after seeing the GIF animations I had up on my website at the time. Although the stuff I had up were things like traces from FLCL, so to this day, I’m still confused as to why he asked me. Around that time, ryo-timo, who I’d gotten to know online, had also been invited, so it ended up being like “Huh? You’re here, too?” I was completely new to working in a studio environment, so I’m sure I did nothing but cause trouble, but spending time at Madhouse from so early on turned out to be a valuable experience. 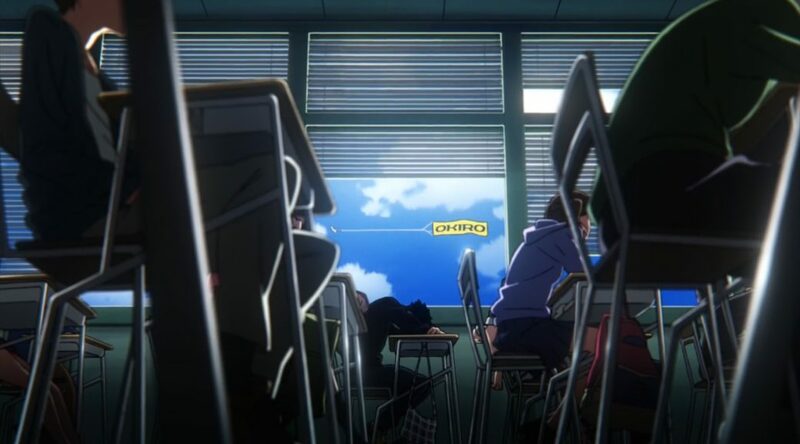 The scene that contained Yuki Hayashi’s first anime work in BECK #01. ─ Which animators did you look up to before joining the industry, if any? It has to be Norio Matsumoto. I knew his name from being recommended his works by episode number from early on. It was the spring after I moved to Tokyo that Naruto #30 aired and I was taken aback at how amazing it was. He worked a lot on BECK, so I was fortunate enough to suddenly come face to face with him. I got to see him drawing key animation, and it was so fast, yet the quality was incredible. And he did it all while looking relaxed. It was quite amazing. ─ After such a positive experience there, why did you choose to join Toei Animation? The fact that [Mamoru] Hosoda, who made Digimon Adventure: Our War Game!, was there, and above all the fact that it had the best working conditions in the industry by far. When I decided to enter this line of work, this was actually one of the conditions during our family discussion, since we knew at the time that this was financially a difficult industry to enter. ─ Your first experience with them was attending the Toei Animation Institute until you graduated in 2005. How was your experience at the time? Half the people enroll after graduating high school, and the other half enter with college or work experience, so the average age is on the higher side. There were 80 people in the animator course, more than 10 in the director course, and maybe 5 or 6 people in the art design course, which seemed like a pretty small number, but I didn’t have another point of comparison. My favorite class was croquis drawing. I was living in Ochanomizu at the time, and couldn’t get the student discount, so paying for the train pass was rough… And then I was invited by Osamu-san to work on BECK, and ended up not being able to attend much at all from my second year on. ─ What about your early days at the studio – did you draw any in-betweens when you were a newcomer or did they directly assign you key animation work? At first it was in-betweens. When it comes to Toei, most of the inbetweening is sent to TAP (Toei Animation Phils.) so there were times when the day would start and there’d be no work to do. On those days I went to go watch movies or take walks outside. There were no quotas and no in-between checkers (!) so I found it extremely relaxed at the time, but perhaps for that reason, I thought in-betweening was pretty fun. I came in and left on time every day. After about 4 months I moved to key animation, but I don’t think I can say my experience inbetweening was standard… Nowadays, I hear they have in-between checkers who train you properly. After getting promoted to key animator for the second Zatch Bell! movie, Hayashi first Toei Animation TV show as regular KA was Gaiking: Legend of Daiku-Maryu. ─ A couple of years later – during the production of Yes! Precure 5 GoGo! – you began working with Rie Matsumoto quite often. What was it to work with her at the time? Did her direction already catch your attention? At first I only knew her as contemporaries, but I joined the team to celebrate her first role as both storyboarder and episode director [Yes! Precure 5 GoGo! #10]. I don’t remember my impression of her as classmates, but at the time, I could tell she drew some pretty great storyboards, and I ended up working together with her more afterward. I believe that episode had lots of great acting planned out, like the bit where Rin-chan brushes off her skirt, or where the three of them run up to the others holding hands. ─ As proof of your work together we have Kyousougiga’s promotional video and pilot episode, which were first streamed in 2011. How did you become involved with the project? In late December of 2010, I was called into a conference room and heard that Banpresto was looking to do an original project, which is what started it all. The project was aiming to be like Hatsune Miku or Black★Rock Shooter where users submit content to video sharing websites, so originally the plan was to have online users add audio over the promotional footage we created. So the first 5-minute PV was made without audio… but not even Matsumoto could storyboard it without any audio cues at all. She ended up drawing the storyboards to some completely different music used as a placeholder. After that, we noticed that the completed footage had audio added to it for some reason. The project probably ended up changing halfway through like, “Let’s add audio!” But it came as a surprise (laughs). I don’t know the circumstances behind that. The PV was delivered in March 2011, so it was a relatively tight schedule. And then there was another piece, this time with dialogue and 30 minutes long, to be completed by the end of the year, so we were quite busy. ─ Busy indeed! Your animation seemed to be everywhere in that work. Do you remember how many layouts and cuts of key animation you drew for Kyousougiga, approximately? As for the number of cuts, it was by all means a lot. Toei was working on about 7 works at the time, so there was a severe lack of manpower, and we were borrowing people from different company productions for each episode, which was quite rough. When we made the TV series, we first drew layout thumbnails for the 500-600 cuts for the key scenes, and planned out the flow of the scenes for all 10 episodes. It makes corrections by the chief animation director a bit easier to have that on hand. 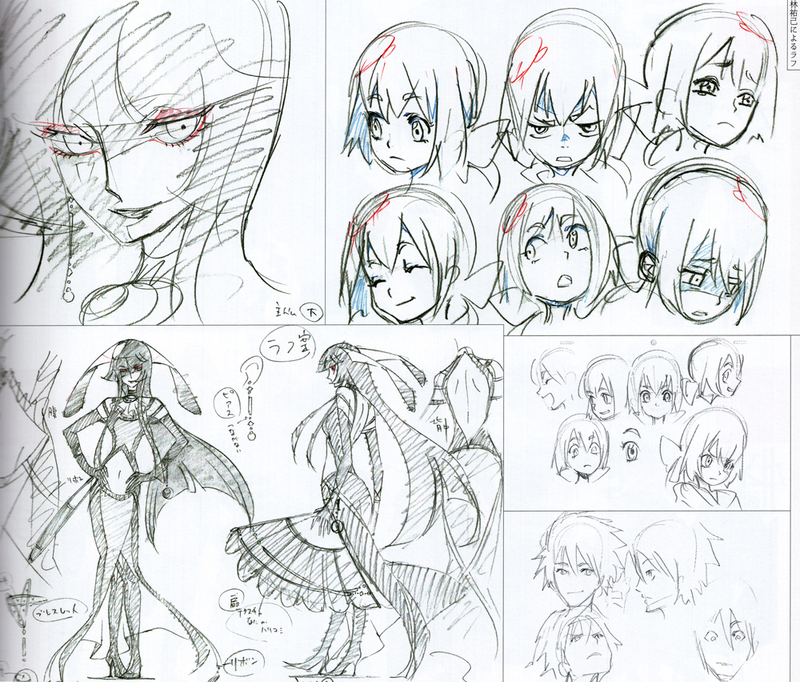 Sample of Hayashi’s early drafts for Kyousougiga, based on Matsumoto’s concepts, as published in the aforementioned visual book. It’s still available for purchase on Amazon JP. Well, drawing key animation is more fun after all. As an animation director, you have downtime where you’re waiting for key animation to come in, so that’s when I often work on it. Actually, since the only one correcting your drawings is yourself, it’s more efficient and you get a lot done. ─ Going back to Kyousougiga: the story changed with each release until we saw the full tale in the TV show. Did you tweak your character designs and animation philosophy between the start and the end of the project too? It was from the second, 30-minute long PV that the voices were added, and perhaps that led to a change of heart, because Koto and Myoue’s characters ended up diverging from what we’d initially envisioned. However, since the cuts in the PVs were short anyway, we’d continued using the existing materials. It was only with the TV series that we took the opportunity to fix up all of the materials, which made me feel better too. ─ It’s been over 5 years since Kyousougiga TV ended already. How do you feel about it nowadays? Sometimes I can’t believe it’s already been 5 years, but sometimes I also can’t believe it’s only been that long. It was a jam-packed project, so I was burned out for a while after it ended. ─ After around 12 years at Toei Animation, you decided to leave the studio in 2017. Can you tell us why? To put it bluntly, I felt that I’d accomplished pretty much everything I’d set out to do there. Since it’s a monolithic company with a lot of long-running series, when I thought about what I’d be doing in 5 or 10 years there, I saw myself doing the same things over and over. At the time, I had received an offer from another company, so I spoke with Toei and worked as a seconded employee for some time. However, there were a lot of restrictions from a contractual standpoint, and in the end, I took my leave of Toei. I thought that after spending 12 years there, there might be something new to see from a complete change in environment with that weight off my mind. That being said, I worked on Dragon Ball Super: Broly recently, and I think it’d be nice to work on Toei projects in the future if I have the chance. ─ Since you had so much experience with them: how would you describe Toei’s working environment? I’ll start by saying that I worked in the old studio building and the Hikarigaoka location, so I don’t know what conditions are like in the new studio building. But it was an environment with a fair amount of freedom for animators. You can choose what series to work on to an extent, and there aren’t any strict quotas. If you have the drive, you can challenge yourself in many ways, but on the flip side, if you choose to fall into degeneracy, you can do so to no end. Across the street, there’s a company cafeteria in the Toei Movie Studios, and it’s an environment where you can survive. But it’s up to you to do so. Personally, I find myself deeply glad that I’d gotten my start at Toei. I’m truly grateful. ─ Has your workflow changed much now that you’re fully freelance? What I do for work itself hasn’t changed much. The number of companies I work with may have increased, but I’m not that adept so I usually focus on work at one company at a time. I get to experience the differences between all the companies I work with, which is interesting. ─ Interesting! While you left the studio though, many of Toei’s brilliant young animators still look up to you. Would you consider yourself their mentor? What was it like working with the younger animation staff? I didn’t have a designated mentor myself – though that’s doing a disservice to all the people who have helped me; I think of a lot of people I’ve worked with as mentors of sorts! Since I’m self-taught in a lot of ways like that though, I’ve indeed tried to pass down the techniques I’ve learned as well as the materials I’ve gathered. But truth to be told, I’ve learned so much from them that I would not call myself their mentor. The young animators at Toei inspire me greatly with their work, and they’ve helped me out in the past. When I left the company, my biggest regret was that I would inevitably get fewer chances to work with them. Hayashi’s legacy at Toei Animation can be experienced at its greatest in episodes like Hugtto! Precure #04/16, which gathered multiple generations of his followers. ─ Speaking of working together with old companions: a few months ago, we saw you collaborate with Rie Matsumoto again. What was it like to work on Baby I Love You da ze, Lotte’s 70th-anniversary project as the character designer? I hadn’t worked with Matsumoto since the Blood Blockade Battlefront & Beyond ending, which had been a year prior, but well, you could say it was the same as always (laughs). It’s a commercial and serves as a BUMP OF CHICKEN music video as well, and in that sense, it was a new experience. However, and this is something I talked with Matsumoto about, I’ve been working on things like EDs, CMs, and short videos, so now I’d like to make something with more of a story element for upcoming works. Vaguely (laughs). Please wait patiently. ─ Will do! Let’s talk about you as an animator before we end, then. There are a few trademarks that are easy to spot in your art, but what’s the mindset behind those personal quirks? Are there? Sometimes certain drawing styles go in and out of fashion in my head, and I make corrections based on those, but I worry that in the end, it always ends up going back to the “same old”. When it’s other people’s designs I can correct them just fine, but when it comes to my own, it suddenly becomes difficult. I’m always trying to figure out the balance between realism and stylization. ─ Finally, what is your number one goal as an animator? Specifically, right now, I’d like to work as the animation director for a movie with original character designs. As I keep coming back to the root of animation, I find myself wanting to create scenes that convey that spark of life and takes your breath away too. That one might be more difficult. ─ Those are the vibes I always get from your work! Thank you for your time. Same I freaked out when I saw that the most badass scene in DBS Broly and that Bump music commercial were by the same person. I consider him to be one of Japan’s greatest TV animators, no exaggeration. He’s fully committed to character expression regardless of context, and his acting’s incredibly articulate while still being economical in nature. You’ll often find yourself thinking his sequences were very extravagant… and then you stop and look at them and realize he simply got insane mileage out of fairly standard drawing counts. Best layouts in the business too! I was not prepared for this kind of deep content here Kevin. Haha, I was very satisfied with his answer there. He explained his very specific goal as an anime creator atm, and then took some time to wonder what he wants to convey on a more general sense. Oh, I still remember BECK, at one time this show was a good motivation for me. Thanks for the interview.